A largely uneventful, and small, far right rally was held in Sydney on Sunday 24 June…writes Julie Nathan. 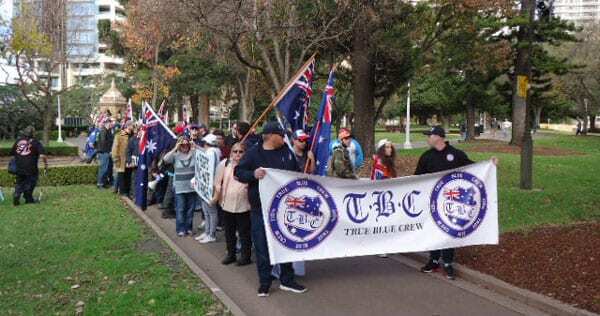 The rally was organised by the True Blue Crew (TBC), a far right group that was formed in Melbourne in late 2015. 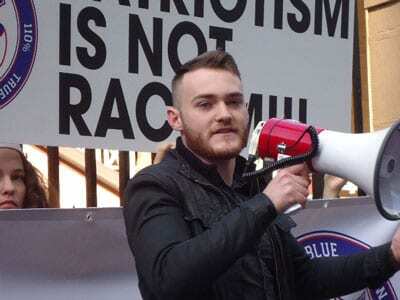 True Blue Crew describes itself as being “against the Islamisation of Australia, the far left wing, or any ideology that seeks to destroy our Australian culture and way of life.” TBC has focussed on opposing Islam and the building of mosques, speaking against so-called “African violence” in Melbourne, and against multiculturalism and socialism. 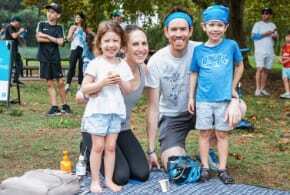 This was the first year that TBC has held a Flag March in Sydney. There were two large placards in the TBC rally denying that the far right are racists: “There’s no hate in pride!! 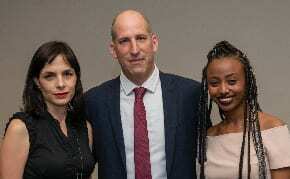 !” and “Patriotism is not racism!! 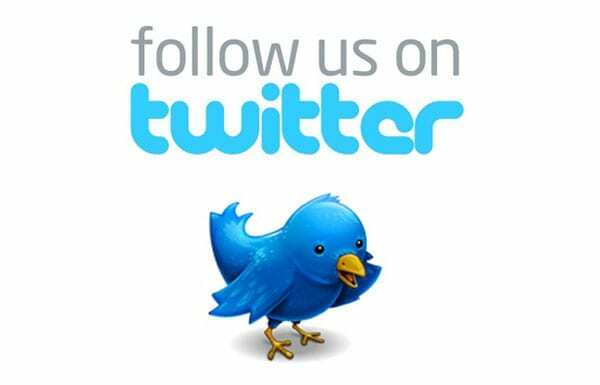 !” each next to the TBC logo. Other people wore their politics on the clothing, like gang colours, showing they belonged to other far right groups such as Infidel Brotherhood. One speaker had the words “Deplorable lives matter” on his t-shirt, and another speaker had “If you don’t love it, leave” under an Australian flag on her t-shirt. 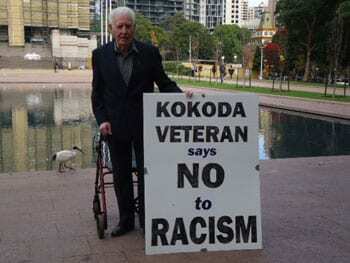 Yet, the one lone counter-protester, Bill Ryan, an elderly man in a walker, and WWII veteran, held a sign “Kokoda veteran says NO to Racism”. Another speaker was Riccardo Bosi, a tall elegant man dressed in a long brown coat, who claimed that the Australian federal government was illegitimate due to sitting politicians being dual nationals, therefore passing illegal laws, and ruling on behalf of elites overseas. “We are at war” Bosi exclaimed. “If we lose the fight” he warned “what we are seeing in Europe is a taste of what is to come in Australia.” He called on people to unite politically, and to “build an army” to vote good people in to parliament. A small rally. An insignificant rally in itself. But a sign that the far right in Australia is still an active force, albeit still on the fringes. Their ideas are couched carefully and covertly so as not to appear too extreme. But underneath the surface, the ideas they propagate are extreme far right and are intolerant of ethnic and religious minorities, intolerant of equal rights for women, and intolerant of those not of their ilk. I don’t know where you got this from ” intolerant of equal rights for women” I think you made that up to make them look bad. Thank goodness there wasn’t any overt anti-Semitism at the rally. But still, if there was, our hard-right brigades; the Nothing Left crew and AJA, would defend it, perhaps not with their lives, for their right to freedom of(hate)speech. Hard right nowadays means anyone who doesn’t agree with leftard ideology. Henry’s comments might be redrawn to read along the lines that if any Jew hating imam were to spout genocidal intent, the left would be there defending its right to cultural identity. Poor Henry just can’t get his head around civilised debate because he isn’t one of its leading exponents. Hence he characterises conservatives as ‘hard right’ because reasoned disagreement with one or more of their positions is just too hard. Or maybe he merely has no arguments of substance beyond intolerant name calling. and the left’s attempts to subject all of us to their set of values using state control and legislation. And you’d be right there insisting Islam isn’t a problem and that the biggest Jew murderers since WWII be welcome here with open arms.